There is now only one site in this stretch of the canal – at Heron’s Close near the church – where lock remains can be identified, but Tallington, like West Deeping, had three locks to cope with the downward slope of the land from west to east. Three locks are marked on the 1813 Enclosure map – shown as pairs of ‘<‘ symbols pointing westwards and upstream – one in West Marsh at the western end of the village, to the south of the main road, one just to the north of the church and the third to the east of the village, in Mill Marsh or Horse Holmes. In the Deepings Heritage book The Stamford Canal they are identified as 9, ‘Copthill Turnpike’; 8, ‘Tallington Village’ and 7 ‘Tallington (Horse Holmes)’. 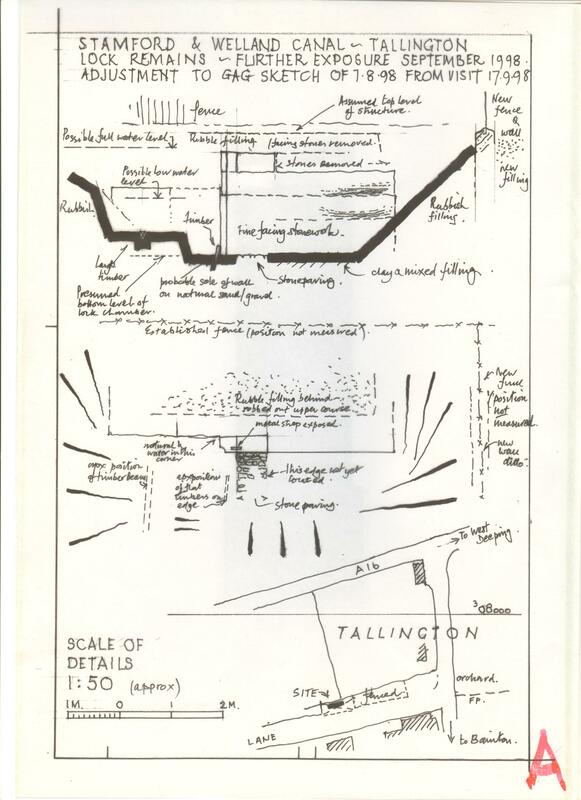 Original documents in the archives at Stamford Town Hall provide some interesting detail about Tallington locks from the 1860s when the canal was deteriorating and the Welland Navigation Committee were considering what repairs would be needed. The committee minutes provide evidence not only of the dilapidated state of the canal but also of the original names of two locks. 15 June 1866 Surveyor’s report: “I find there are dams put across the canal immediately in front of the doors at … Cross Lock and Marsh Lock. … the bridge and doors of the sluice against the Cross Lock have been entirely removed”. Being near the bend, it is evident that the “Copthill Turnpike” lock should rightfully be called the “Cross Lock”. (Some of the West Deeping Heritage Group that walked this stretch of the canal route in 2013 were thrilled to discover a distinctively-shaped stone block lying in the hedgerow close to where the lock is thought to have been.) The lock to the east of Tallington was then “Marsh Lock”, referred to in the Surveyor’s report. A map showing Lord Chesham’s property adjoining the canal confirms this – although it looks as if whoever drew the map had difficulty spelling “Marsh” for it looks more like “March”! Another archive has been the source of some confusion to researchers. 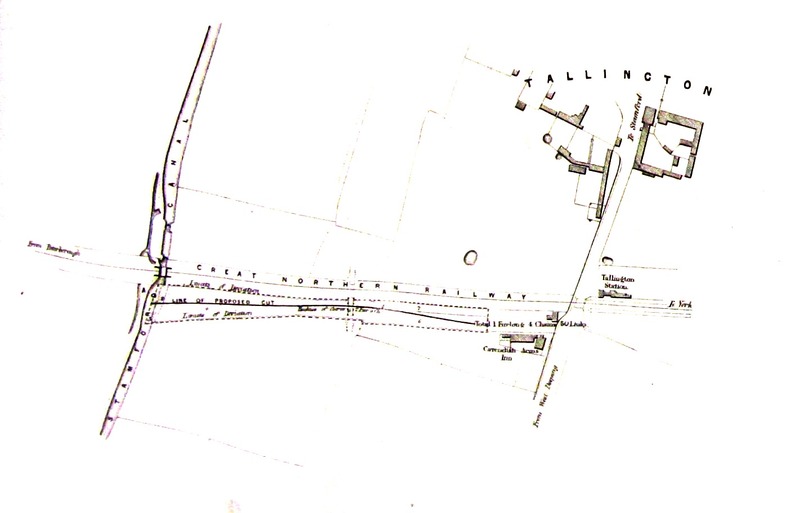 The 1810 map of Bevan’s proposed extensions to the canal shows only 2 of the 3 locks in the Tallington section. The canal is shown in blue, outlined in black, with each lock marked as a single thick black line. In the copy we have seen, the lock to the east of the village (7) is not marked but it was the middle lock (8) that was evidently missed by later investigators. (Maybe there are different copies of the map with some details missing; maybe it is the very small scale of the drawing that meant a detail was missed. 10 years later, with digital photography it is much easier to enlarge images.) To add to the confusion, lock 8 is also missing from the otherwise-detailed descriptions of the 24 lots to be offered by auction when Stamford Corporation attempted to sell off the canal in 1865! In 1992, when Garland Grylls redrew Bevan’s map on an up-to-date Ordnance Survey map, he showed 11 locks, missing out lock 8. On 7th August 1998 our survey party visited the site, confirmed the stonework as being part of the lock abutments and made a survey of what had been exposed. This was unfinished as the rubbish was being burnt in the ditch beside the stonework. Another visit was made on 17th September that year and the sketch survey improved. The stonework turned out to be the part of the western gate abutments on the north side of the canal. Stonework stood about two metres above the bed of the lock and was probably once another half metre higher. 1 abutment is identified by the carved indented vertical groove which must have received the heel of the lock gate. Measurements and surveys were compared with other lock remains at West Deeping and Deeping St James and the experts agreed that the details matched. If the lock is the same dimensions, with a width of 11 feet or 3.35 metres, it is possible that under the tarmac of Heron’s Close are the remains of the southern side, and equally possible that 85 feet or 26.2 metres away to the east, next to Bainton Road, the downstream abutments could be found. In the 1970s, there are reports of lock gates being visible in a nearby garden. By the 1990s these must have disappeared; the 2013 project has not been presented with any evidence as to their whereabouts.